One of the nicest things about having a wine cellar is being able to walk in and browse for something for dinner. It is a real treat to discover a wine that I haven’t had for a couple of years. That happened this week when I wanted to find something to warm me up during our cold spell. I went to the shelves where I keep Syrah, Petite Sirah and related blends when I saw the Miro. I immediately started smiling because I remembered how much I had loved that wine. I loved the wine when it arrived, and I have been loving it ever since. I noticed I had four of those bottles left, so I pulled one out for dinner. I’m so glad I did because it was wonderful. When I tasted the wine right after I opened it, I was afraid it had gone bad. But I decanted it and showed some patience. And sure enough, about 90 minutes later the wine was incredible. Silky smooth, fruity, lush mouthfeel, with good structure, and no harsh tannins. Miro Petite Sirah is inky dark. The winery calls this wine “dark and delicious,” and they are right on the mark. It is loaded with wonderful aromas and tastes of blackberry, blueberry and black cherry, with touches of vanilla and graphite. This is a big wine with a long finish. Petite Sirah is a powerful wine, but with a few years of age it mellows nicely. I liked this wine a lot when I first tasted it, but it is even better several years later. The grapes (100% Petite Sirah) come from Sommers Vineyard near Healdsburg at the south end of the Dry Creek Valley, known for exceptionally good Petite Sirah and Zinfandel. The grapes are hand sorted and destemmed for whole berry fermentation in small lots. The wine was aged for 17 months in oak barrels. Who knew that Petite Sirah could taste this good after 8 years in the bottle? We enjoyed it so much while cooking that I had to open a second bottle so we would have some for dinner, and for watching the national championship football game after dinner. And maybe if Dan had been drinking this great Petite Sirah instead of his pumpkin beer, Auburn might have won. I know by the end of the game I was feeling pretty mellow. I’m not sure if any of our local wine stores stock Miro wines, but you can get them to order it. I’ve also had the Cuvee Sasha, a Grenache, Syrah, Mourvedre blend, and it’s wonderful, too. They also make a great Cabernet Sauvignon and a Zinfandel. Winery: Winemaker Miro Tcholakov was born and raised in northern Bulgaria, a region with centuries of wine making tradition. He learned the art from his grandfather who had made the family’s supply of wine for years. He earned a degree in viticulture and in 1990 won a spot in an international exchange program set up by the Future Farmers of America. He worked briefly in Napa and then became a temporary harvest intern at Sonoma’s Dry Creek Vineyards. That turned into a nine-year job as he moved up through the ranks, becoming cellar master and then assistant winemaker in 1997. In 1999 Trentadue Winery hired him as winemaker just in time to oversee the harvest. The wines from his first vintage there won many honors including the sweepstakes winning Zinfandel at the West Coast Wine Competition. Over the years his wines have continued to win medals, and he has been recognized as one of the top winemakers in the United States. In addition to crafting fine wines, Miro’s duties at Trentadue include overseeing custom crush operations from winemaker clients. 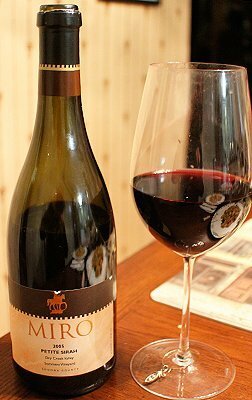 In 2001 Miro became his own client with this first Petite Sirah vintage of Miro Cellars. His wines quickly won raves from well-known wine critics. Miro continues as winemaker at Trentadue, but his own label specializes in one-of-a-kind specialty wines from the finest grapes sourced from top vineyards. Tcholakov says he likes to make high quality wines that he and his friends like to drink. He also believes in keeping prices down. The Madara Horseman on the wine label is based on a Bulgarian monument carved in bas relief 23 meters above ground level in an almost vertical 100-meter high cliff. This mysterious sculpture was created at the beginning of the 8th Century during the birth of the Bulgarian nation. One-dish meal with hearty wine keeps us warm. Goes with: Teri and I had this with a shrimp fried rice I whipped up to use some of the shrimp we bought at our last trip to the beach. I cooked the shrimp in it in the wok with a lot of vegetables, ginger and garlic, and soy sauce, and it turned out really well. Many people will tell you you should drink white wine with shrimp, and I generally agree with that. But when it is as cold as it has been lately, nothing beats a nice red wine. So we opened the Miro Petite Sirah. It was an inspired pairing. 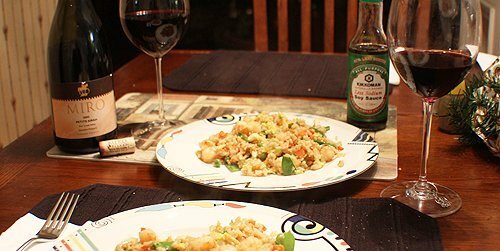 The wine is about at its peak, and the silky smooth, rich flavors meshed wonderfully with the shrimp fried rice. I used brown rice, so its nutty flavor also went better with red wine than white. This isn’t a big, oaky red, so pairing it with a dish like this shrimp is an easy choice. Soft fruit and mellow tannins mean this wine will pair with a wide variety of foods from shrimp to steak. Wow! What a wonderful writeup! So happy to read that you enjoyed the wine. I’m pretty sure Miro and I drank our last bottle of the 2005 Petite Sirah a few years ago. Thank you so much for this blog post—I’ll ask Miro to read it since I know he’ll enjoy it too. Would it be okay for me to link to it from our web site? Molly, if I haven’t replied before now, I apologize. Of course, you may link to it from your web site. It was a wonderful wine.